Stand-up comedians aren’t exactly known for their innate grasp on the laws of physics. Which is fine, since you also don’t meet a lot of funny physicists. (Sorry, Sheldon Cooper isn’t real.) That said, the time-honored bit about “If nothing can destroy the black box, why don’t they make the whole plane out of the black box?” does raise some interesting questions. Like how is the black box made? How do they test it? How does it operate? And why can’t you just build a whole plane out of the same material? 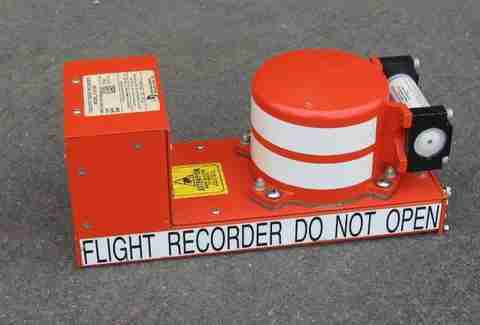 So, to make sure the next time someone cracks that joke, you can heckle them with weirdly detailed scientific facts, we put together this quick primer on the infamous flight recorder. When that CNN anchor tells you for the fourth time in 20 minutes that “authorities are still looking for the black box,” she’s wrong on both accounts. The black box is actually a cylinder mounted on two large pieces of metal and looks more like an air compressor than a tape recorder. The term “box” refers to when the recordings were made on metallic tapes, which, much like the ones you wore out listening to “Forever Your Girl,” have been replaced by digital memory boards. While some older models do still exist, most are slated for replacement. Also, they're not black; no, they’re painted picking-up-litter-on-the-highway-road-vest orange. Since that, as you can imagine, is easier to find in a forest of rubble. 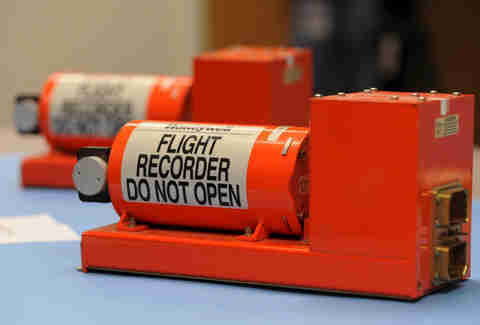 First, there’s the flight data recorder, or FDR. It records at least 88 required parameters about the flight, including airspeed, altitude, rudder position, wheel position, air pressure, and (if you believe the flight attendants) who still has their cell phone on at takeoff. Second, there’s the cockpit voice recorder, or CVR, that records everything the folks in the front cabin are talking about. While the old magnetic-tape versions could store up to 30 minutes of talk at a time, the current digital recorders can record up to two hours (which, honestly, still seems kinda low considering you can record 80 hours of Duck Dynasty on your DVR without a problem). Once that two hours is reached, the CVR records over old material. 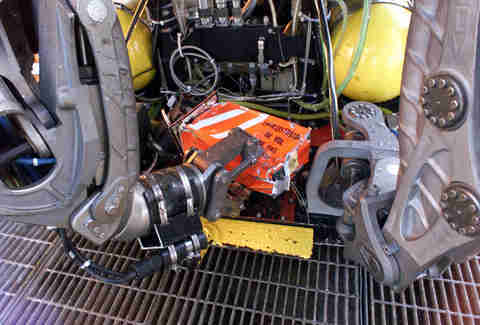 When it comes to locating the black box, what transportation investigators are actually after is the Crash Survivable Memory Unit (CSMU). It’s the cylindrical part of the device that houses the memory boards, where all the data from the FDR and CVR is stored. How do they protect the CSMU? First, they wrap the boards in aluminum and put them under an inch-thick layer of heat-protective silica; this absorbs the heat of a crash fire and keeps them from melting. From there, they surround the unit with a half-inch of stainless steel or titanium, tested to withstand forces harsher than that of your average airline crash. 1. The black box gets shot out of an air cannon at 3,400 times the force of gravity (or 3,400 Gs, if you’re cool/still like to quote Top Gun). It hits an aluminum target at about the force of a jumbo jet hitting the earth. 2. For five brutal minutes, it’s crushed with 5,000psi (pounds per square inch) of pressure to ensure it can withstand a sustained impact. 3. 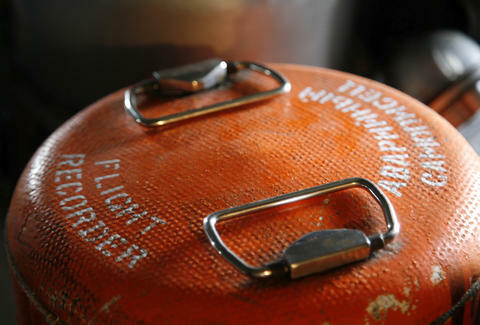 To test it against fire, the box sits inside a 2,000 degree fireball for an hour. Without sunscreen. 4. Then, testers do a full-on Jacques Cousteau and drop it into a pressurized saltwater tank, simulating the water pressure at 20,000ft below the surface. For 24 hours. In a slightly less-pressurized environment, it must then survive 30 days completely submerged in saltwater. 5. And if all that wasn't enough, a 500lb weight with a quarter-inch pin sticking out is dropped on the box from 10ft up to make sure it won’t puncture. You may recall that aforementioned CNN anchor telling you that searchers were trying to find the black box's homing beacon. That's actually an accurate statement, as there’s a water-activated transmitter on the outside of the box (known as the Underwater Locator Beacon, or ULB) which emits a signal -- one per second for up to 30 days from as deep as 14,000ft under water. If the boxes are recovered from a water crash, they’re actually transported in a cooler so that nothing dries out or rusts. Because that’s presumed to be the most crash-resistant part of the plane. It's the Flight Data Acquisition Unit (FDAU) -- which acts as "information central" for all the flight data -- that's located under the cockpit, and sends all of its info to the black boxes in the back for safe storage. In case you skipped ninth-grade physics/are a stand-up comedian: it’s too heavy. Your typical airplane's made out of aluminum and plastic, among other materials, and is fairly lightweight for a machine of its size. 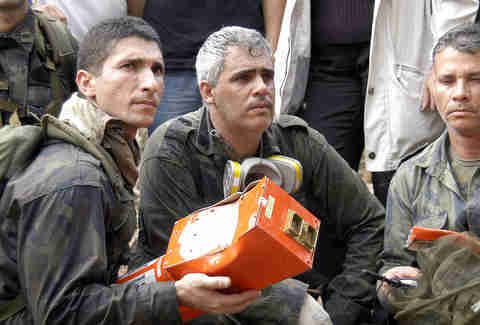 The black box is made of stainless steel or titanium, and at 10x10x5 inches, weighs about 10lbs. 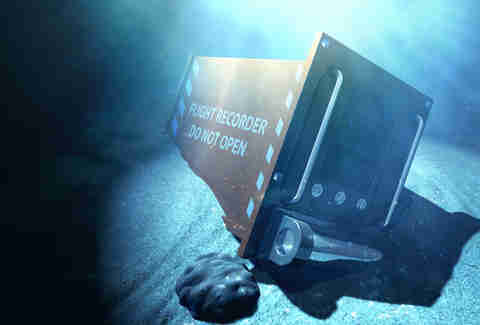 Building the entire plane out of the black box would pretty much render it too heavy to fly.